Japan today is a modern democracy and economy comparable to the European and USA model of politico-economics. A wealthy nation of more than 100 million people that is extensively involved in world wide commerce. It is now common to see Japanese tourists throughout the world and Japan itself now features as a popular destination for Western tourists. Japanese products from high-tech companies like Sony are to be found all over the world and have played their part in enriching society and culture - one only has to think of the once ubiquitous "Walkman" of the 1980s. This has not always been the case and throughout most of its history Japan practised an "isolationist" policy that allowed trade and contact with foreigners but restricted their movement and influence to small enclaves on the coast. 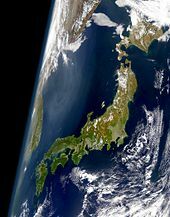 Japan is located on an archipelago of mountainous, volcanic islands in the northwestern corner of the Pacific Ocean. Before the Spanish began sending ships between Mexico and the Philippines late in the 16th century there was almost no naval activity in the Pacific ocean that had the capacity to disturb Japan in any way. To the Japanese, the Pacific was a boundary of their world, not a route to somewhere else. They never had to give any thought to what might be on the other sides. To the south, there is an almost continuous chain of islands extending from Tanegashima, just off the southern end of Kyushu, down through and beyond the Ryukyu Islands all the way to Taiwan. There is no doubt that there has been movement of people up and down this chain and the people of the Ryukyu's have spoken a dialect of Japanese for a long time. However, the islands are simply too small to have ever become important. The Ryukyu Islands long had no official contact with Japan, but dealt rather with China for several centuries. They were taken under Japanese control in the 17th century to make sure that they did not fall into the hands of the Spanish or Portuguese, but were not incorporated into the Japanese state at that time, being a private possession of the Daimyo of Satsuma. To the north, Japan was bounded by the large island of Hokkaido. This also was never considered a part of Japan before the Russians appeared on the scene and the Japanese took steps to establish a presence there in order to keep them out. The native peoples of Hokkaido were neither numerous enough nor technologically advanced enough to cause the Japanese any concern. Japanese trade during its early history was mainly with Korea and China. The Japanese islands are laid out in such a way that from the Chinese point of view they are largely hidden behind Korea. It is about 500 miles across the East China Sea from Shanghai to Nagasaki. In early days that was an extremely dangerous voyage (shipbuilding technology being primitive) and communication was usually by way of Korea and the Shantung Peninsula, reducing the longest water crossing to 200 miles or so. Korea was a nervous country, being relatively small and living next to dangerous neighbors in China and Manchuria, and through much of its history it discouraged active contact. This policy applied to Japan as well. The periods of time during which Japan and Korea officially ignored each other are significantly longer than the ones during which they had frequent contact. Fishermen and others crossed all the time, of course, but without noticeable impact on higher culture. All of this makes Japan an unusual place. It really is different from any other place, even Korea and China, in architecture, clothing styles, food, literature, music and dance, social customs, weapons and armor, political habits, and religion. Despite modern business suits and McDonalds, it remains different today, as anyone who spends significant time there will quickly discover. About 75% of Japan is heavily forested mountain land that is thinly populated. Almost everyone lives in a restricted number of relatively flat lands close to the seacoast, all of which are separated from each other by mountains, which come down to the sea in many places. Land transportation has always been difficult and until railroad lines began to be constructed, wheeled transport was not commonly used. Bulky goods were transported along the coast by boat, and if people didn't take a boat they normally walked. Generally, only soldiers rode horses. There were only a few places near cities where there were bridges over rivers. People waded the shallow ones and took ferries across the deep ones. There are three main islands and a large number of small ones. One ancient name for the country was "the 88 islands". The biggest island is Honshu (which means mainland), the next in size is Kyushu (which means 9 provinces), and the third is Shikoku (which means 4 provinces). When the country was first unified politically, the government laid out a series of routes (it would be stretching it to call them roads) which, because of the mountains, established natural regions. It is well to get familiar with these because you will see these names all of the time. The Inland Sea (between Honshu and Shikoku) side of Honshu was called the Sanyodo (route on the sunny side of the mountains) and the Japan Sea route on the other side of Honshu was the Sanindo (the shady side). The mountains between these are particularly rough, so these really are almost different worlds. Honshu north and east of the ancient capital area (modern Kyoto, Osaka, and Nara) is wider, and so there were three routes, one on the Japan Sea coast, Hokurikudo (northern route), and two on the Pacific Ocean side of the main mountains, the Tokaido (eastern ocean route) and the Tosando (eastern mountain route), which meet each other north of Mt Fuji and near the future location of Tokyo. Other terms that are widely used are Tohoku (meaning northeast) for the far northeastern part of the country, Kanto (east of the barrier) for the large plain surrounding modern Tokyo, Kansai (west of the barrier) for the capital area, which is also called Kinai (inner region) or Kinki (near by region). The area between the Kanto and the Kansai is often called Chubu (middle part). There are three different schemes for dividing Japan into administrative units. In the late 7th and early 8th centuries the government set up a system that created what we conventionally refer to as provinces. When the system was finalized there were 66 of them. A province was given a local government structure that included a governor who was sent out from the capital. Even after that system collapsed the feudal regimes of the medieval period continued to use the province as a convenient geographical descriptor, and the system was not formally abolished until the 19th century. Then the government established a new system with different units that we have agreed to call prefectures in English. There are 47 prefectures, so they are bigger than the old provinces, and their names and boundaries ignore the province system completely. In between, the Tokugawa Shogunate had its own system which was entirely different. It is hard to describe briefly because it was constantly changing with the ebb and flow of politics. The government directly ruled about 1/3 of the country, including all of the big cities. There was no formal division of this area into units. The rest of the country was assigned to quasi-feudal vassals as privately held domains (called han). The larger han were directly administered by their owners who collected their own taxes and maintained their own military forces. The smaller han were usually fictional in that the central government ran them and the owner was entitled to a fixed annual revenue paid out of the government treasury. The biggest han were all located on the periphery of the country and might be as big as a prefecture, but many were quite small. The government liked to keep the vassals who had han nervous and obedient. Han were constantly being enlarged or shrunk. Many were abolished and many new ones were established over the years. Han lords (daimyo) were not infrequently forced to give up one han and move to another on the other side of the country. It is therefore not really possible to create a map of han. It would require a large book of maps to show all of the changes in the system. There are good articles in Wikipedia on "The Provinces of Japan" and "The Prefectures of Japan". There is also a "List of Han" that is self-described as incomplete. However, it includes the major ones. I strongly recommend that anyone who is interested in historical topics should buy a modern tourist guidebook to Japan as a source of good maps and geographical information, although everything will be shown and described in terms of the modern prefectures. A large proportion of the tourist highlights are things that have survived from earlier historical periods and these will be described and pictured. There is also a list of Prefectures on the page "Japan Today". In the 19th century a system was devised for rendering Japanese syllabic script into our alphabet by a missionary named Hepburn. This became widely used and you will find it in many older books. There is a description in Wikipedia under "Hepburn Romanization" It was replaced almost universally in the English speaking world by a new system that makes it particularly easy for English speaking people to pronounce Japanese, at the cost of leaving certain things out. This is confusingly called the "Modified Hepburn System," though it is very different from the original. I believe that it was mainly created by E.O.Reischauer, historian and sometime US ambassador to Japan. There is a similar system, nearly identical, in fact, which was officially adopted by the Japanese government. However, the Japanese do not romanize Japanese often, roman letters (romaji in Japanese) being normally used only for foreign words and phrases, so you will see the American "modified Hepburn" system more often than anything else. There are no sounds in Japanese that are not also in English and the spelling is regular. All consonants are the same as ours. The letter "i" is pronounced as it would be in Italian or Spanish, which is to say like the "e" in me. The "e" is pronounced as in merry. The sound we mostly use "i" for is spelled "ai" in Japanese. The letter "o" is always the "o" in row (a boat), and the "u" is always like shoe. The letter "a" by itself is as in father. If you should listen to the way that Japanese pronounce things, you will hear them pronounce the same vowels in two different ways. One variant is short and quick, in the other the sound is held much longer than we ever do in English. Tokyo sounds more like To-o-kyo-o. Technically, one is supposed to indicate this by using a macron over "o" and "u" when they are lengthened, but this causes so much trouble in practice, especially with computers (searching and sorting are both messed up), that it is almost never done. The official Japanese system uses the circumflex accent ^ instead of the macron. That is about the only thing that is different. For those who know Japanese it is relatively easy to know when to use long and when to use short vowels. That is because this issue came into the language with the adoption of many Chinese loanwords. There are a lot more sounds in Chinese than in Japanese. The word that the Japanese represent as "chu" with a long "uu," for example, is pronounced as "jung" in modern Chinese. The Japanese can't handle the "ng" sound and the long "u" is the result. The Japanese actually spell this out in their syllabary, writing the equivalent of "Toukyou" or "chuu". The original Hepburn notation captured this distinction. However, it has many annoying features and the new system is better. I should perhaps mention that I am only talking about systems intended for English speakers. There are many others in the world, and since they are designed with the spelling conventions of a different language in mind, they often look strange to our eyes. I have seen the French and German ones. In Chapter 9 of the first volume of the Cambridge History of Japan Edwin Cranston observes that the modern Japanese have what is probably the most complicated writing system in the world. Fortunately, it is not really necessary to know anything about it in order to explore Japanese history. There is an article on it in Wikipedia, and a wikibook (for learners) at Japanese. The main complicating factor is that in nearly all cases Chinese characters are used for the very large number of Chinese loan words in Japanese. These are pronounced according to Japanese renderings of the original Chinese. Nearly every character also has one or more additional readings which are native Japanese words, and characters are routinely used in normal writing with these readings also. Since Japanese is an inflected language (one in which words are changed to reflect differences in grammatical usage) and Chinese characters don't inflect, an inflected word is written using a Chinese character to establish the main meaning and then the inflected ending is spelled out using Japanese-developed characters that represent one of 51 different syllables. There are two independent versions of this "syllabary", one with "curvy" characters (hiragana) and one with angular ones (katakana). The first is used most commonly, these days, with the second used in ways similar to the ways we use bold-face or italic characters, or for spelling foreign words. Both can therefore be used in the same block of text. Often foreign words are converted to sounds that the Japanese can say and are spelled out using katakana, but it is also not uncommon to simply plug in the original roman letters. One block of text can therefore use four different writing systems. Complicated indeed, you don't need to know this but it is good to understand the difficulties the translator faces. Both Korea and Japan adopted the Chinese calendar system and retained it until they switched to the western system in recent times. The Chinese system was a complex one that was a mixture of lunar and solar elements. There are good articles on this in Wikipedia, including details of both the Chinese and Japanese variants. The everyday calendar was a lunar one which would inevitably fall out of synchronization with the solar calendar. This was handled by making adjustments on the same general principle as our "leap year". An extra month was added whenever necessary to prevent new year's day from deviating too much from its "home position" in the solar calendar. This is because the lunar month was set at 30 days, which means 360 days to the year. An extra month was not added every year, and the rules for deciding when to do it are the main difference between the Chinese and Japanese versions of the system. Most people will be aware that the Chinese lunar new year occurs later than our modern new year, and that it occurs on different dates from year to year. There are names for the months in Japanese but they are not used in official documents, even today. It is simply first month, second month, and so on. It is possible to convert dates from the lunar calendar to the modern calendar, but it would be a lot of trouble and no one bothers. If you see a date in historical writing that says 15th day of the 3rd month, it will be a lunar calendar date and it will probably not fall in March. After the Japanese changed to the modern calendar, authors will usually write March 15th (though the Japanese still say 3rd month). The exact date is not really so important unless you want to organize a celebration of the thousandth anniversary of some famous event. A more serious matter for the reader of history is counting years. The Romans dated everything by the names of the two consuls for the year. You would need to have a complete list (one was on display in the Forum) in order to arrange things in their proper order. The Chinese were not quite as bad, but almost. They very early developed the custom of proclaiming an auspicious "reign title," something like "perfect harmony" and then dating things in terms of that. If "perfect harmony" then suffered some catastrophe, like a dangerous rebellion, the court might very well decide to change its luck by coming up with a new name. This could happen at any time during the year. So, the 14th day of the 5th month of the 6th year of "perfect harmony" could be followed by the 15th day of the 5th month of the first year of "glorious dawn." Later on, the historians would clean things up by retroactively using "glorious dawn" for the whole year, but the government offices would still be full of files containing documents with the now imaginary 6th year of "perfect harmony" written all over them. And, as in the Roman case, you need to have a list of all the reign names to keep track. This system was started by the Han dynasty in 163 BC. Every dynasty used its own titles (often recycling names already used one or more times). Taking only important dynasties, there are just under 400 of them. Initially the Korean kingdoms simply used the Chinese titles, but they soon enough started inventing their own, as did the Japanese. This is where the January problem comes in. In Japan the first year of Kansei "lenient government" corresponds approximately to 1789. If I write Kansei first year, first month, first day, that is a purely Japanese date. If I try to make things clearer by saying 1789, first month, first day, you might now be thinking something very different. What I will do in my essays is use 1789 most of the time because it should not be necessary for a reader to have a list of all of the year names. However, this will be a lunar date and the first day of the year would not be January first, but sometime in the spring. If I should have some reason to use more precise dates, then I will say Kansei 1 (1789). Should it ever come up, there is a program on the Web called "nengocalc". "Nengo" is the name for a reign title. Nengocalc permits you to reliably convert back and forth from traditional dates to modern dates. The Japanese still use reign titles, by the way, but they now follow the convention started by the Chinese in the Ming dynasty where each emperor uses only one. If I have counted correctly the official Japanese total is now 247, including a period in the 14th century when there were rival emperors using different titles simultaneously. There were also "unofficial" titles used at various times in the past. The reign title associated with the current emperor is Heisei. Heisei 1 was 1989. After his death the emperor will be known as "the Heisei Emperor." The reigning emperor is always referred to as Tenno Heika, "his majesty the emperor." Only foreigners would ever call him Emperor Akihito. Japanese, Korean, and Chinese names are always written family name first. Writers in English frequently reverse them, but this opens the way to confusion and I prefer to keep the proper order at all times. Mao is the family name and Tse-tung the personal name. In China the Ch'in dynasty began a convention that continued down to the end of the dynastic system whereby an emperor was given a reign name that had no relation to the name he had borne previously to his enthronement. This name was usually awarded only after his death, and it was often descriptive. For example, the most militaristic of the Han emperors is named Han Wu-ti, meaning "the martial emperor of the Han dynasty." A milder mannered Han emperor was Wen-ti, the scholarly or cultured emperor. For the Ming and Ch'ing dynasties the emperor's posthumous name was the same as the reign title used when he was alive. That has also become the rule in Japan but applies only to the last four emperors, the Meiji Emperor, the Taisho Emperor, the Showa Emperor, and the reigning Heisei Emperor. Prior to that each emperor was given a posthumous name separately from the system of reign titles. This custom was started late in the 8th century but all earlier emperors were given reign names at that point and historians routinely use them because they are short and simple and at no time is it considered proper to identify the living emperor by using his ordinary name. This page was last edited on 23 October 2016, at 14:30.